Petite Sirah is awesome. We all know that. If you don’t know that, go buy some and find out for yourself what you’ve been missing. The other day a box of wine from the very first producer of Petite Sirah in the US arrived at my door, hooray! 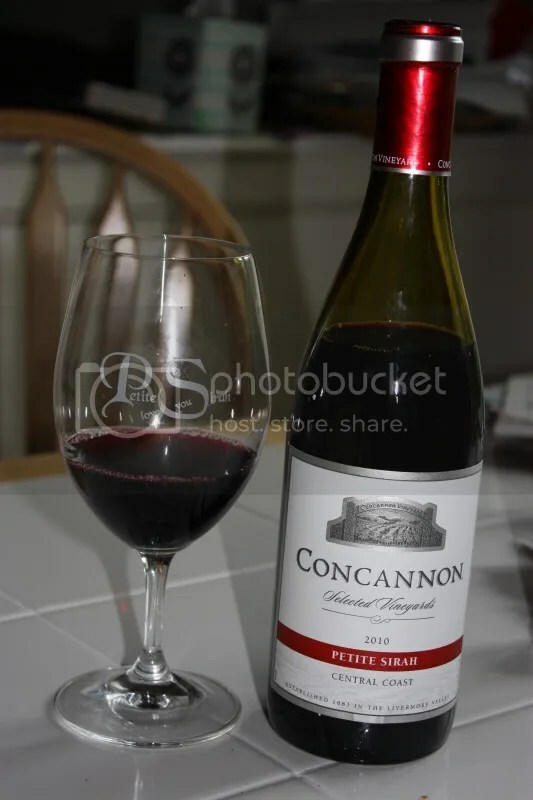 In case you don’t know, Concannon Vineyards was the first US producer of Petite Sirah back in the early 60s. 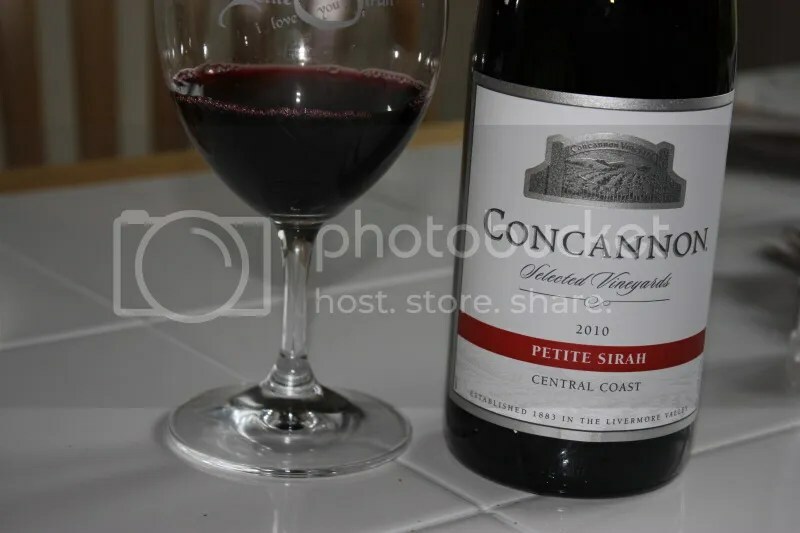 We tried the 2010 Concannon Selected Vineyards Petite Sirah with our bbq ribs a couple nights ago. It has a plastic cork closure, clocks in at 13.5% alcohol by volume, and retails for around $8.50. 1.) 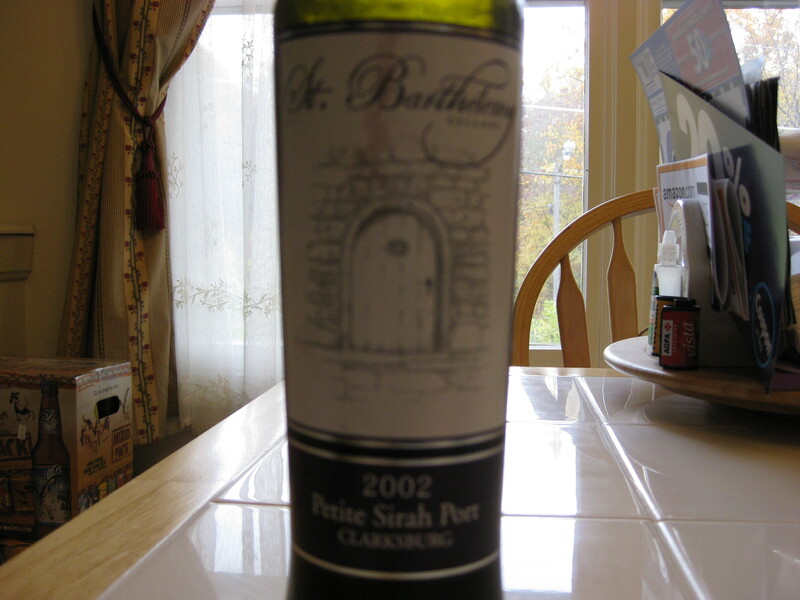 For $8.50, the Petite Sirah had a heck of a lot to offer and would be a fantastic party wine. 2.) Imagine a blueberry pie drizzled with chocolate in a glass. That’s this wine. 3.) Definitely serve it with BBQ ribs. 4.) I rally can’t believe it was only $8.50. On the nose I found blueberry, berry jam, blueberry pie, spice, chocolate, vanilla, cream, and herbs. In the mouth this wine was all blueberry, all the time in jam and pie form, with some chocolate and spice notes and perhaps a hint of black currant. The wine had good acidity and tannins. *Disclaimer: I got this out of a box of wines from Hahn Family Cellars when I went to the Wine Blogger Conference this summer. We all know I sort of love Petite Sirah. A lot. After Zinfandel, it was the second kind of red wine that made me stand up and say “yum.” I dig the deep dark wines made from Petite Sirah grapes and all the blueberry pie that comes with them. So I jumped at the chance to give this Petite a try when I saw it in a box of wines from Hahn Family. Especially given that you can find this Petite for as little as $10 online. 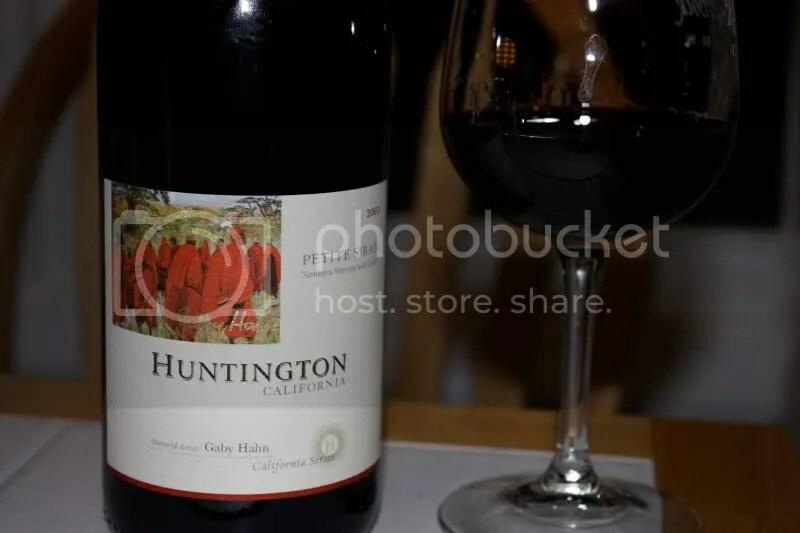 The 2007 Huntington Petite Sirah clocked in at 14.5% alcohol by volume and a Diam closure. On the nose I found blueberry, blueberry cobbler, cream, vanilla cream, blueberry ice cream, chocolate, spice, and anise. In the mouth I got strawberry, chocolate, bright berries, blue fruit, something that I want to call huckleberry, and lots more strawberry. Overall I found this Petite to be fruity and big, like dessert in a glass. For $10 this is a steal. *Disclaimer: I received this wine as a sample from Artisan Family of Wines. Petite Sirah! Petite Sirah! Petite Sirah! 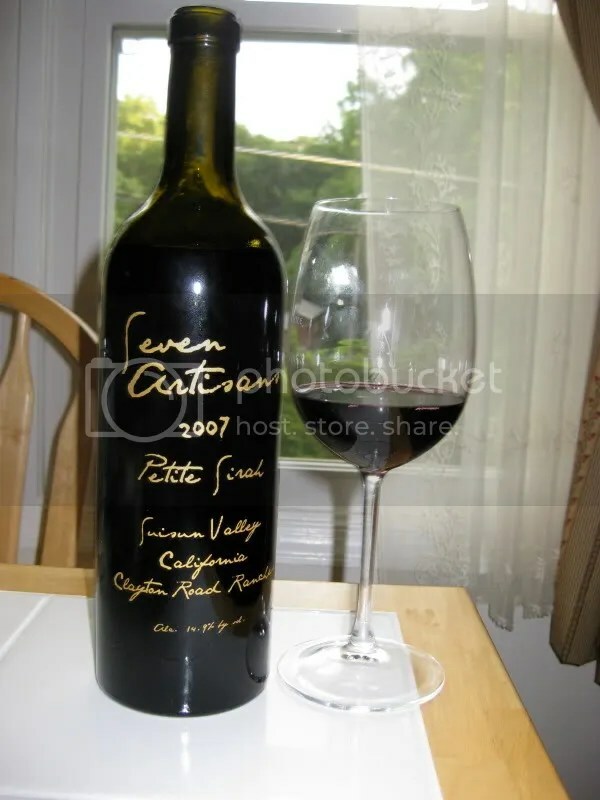 Well, Petite Sirah is a quick way to my heart, I love the stuff! 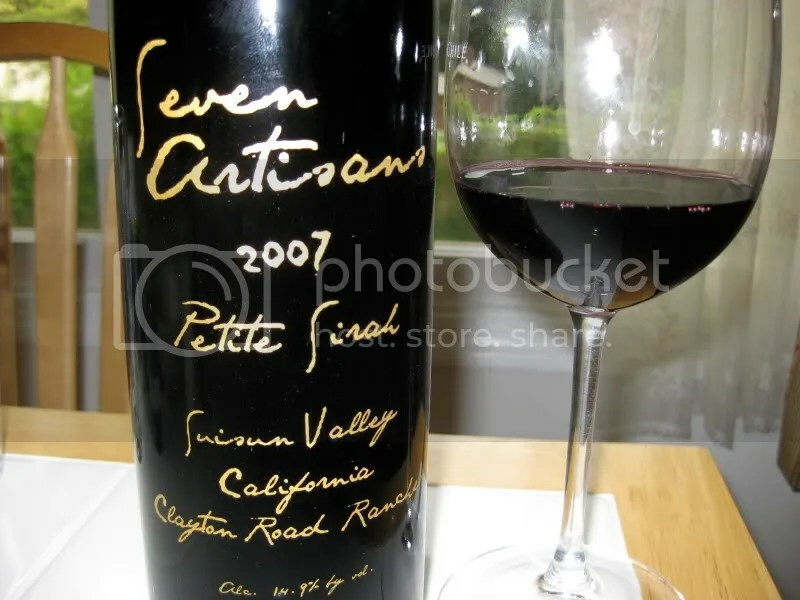 We opened up the 2007 Seven Artisans Petite Sirah the other night, clearly killing it in its infancy. Poor wine. It’s a baby. The parts are there, but they need time to meld together. After 3-4 hours in my glass, the wine showed some of its potential, but probably could have used a night in the decanter. The Seven Artisans hails from the Suisun Valley, clocks in at 14.9% alcohol by volume, has a real cork closure, and retails for $17.99. On the nose I got blueberries, cream, blackberries, blue fruit, pie, vanilla, blueberry cobbler, fruit punch, more blue fruit and blueberries…more blueberries, blueberries, and blueberries. After this got going, it was extremely aromatic and yummy smelling. In the mouth I found fresh tart blueberries, blackberry, raspberries, more red fruit on the edges, bittersweet chocolate, anise, some more raspberries and blue fruit o the finish. This had tannins to spare…so decant. Or stick it in the basement for a couple years. Yum! After a day of this, nothing beats a glass of red wine! 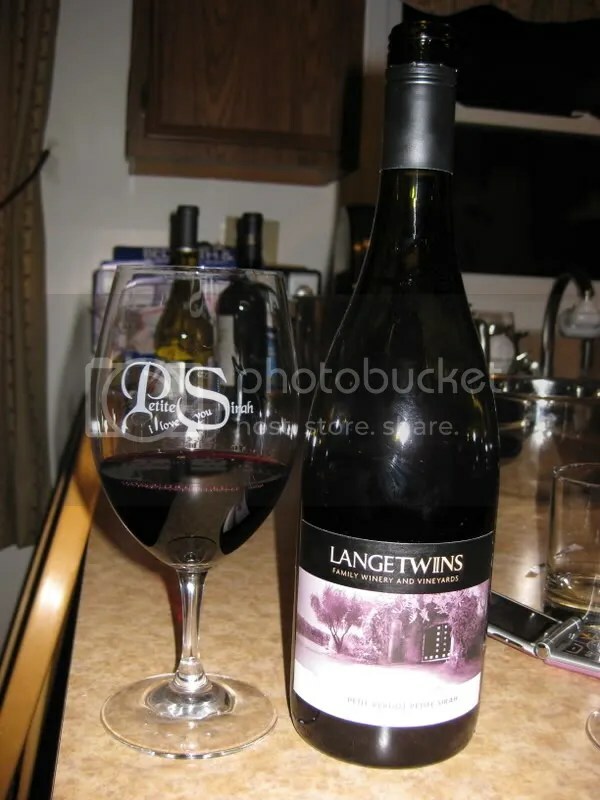 *Disclaimer: I received this wine as a sample from Lange Twins Winery. After being out on the slopes all day, I want nothing more than something that will warm me up. For me, that’s a great big bowl of soup and a big red wine. Now, the red wine doesn’t always go very well with the soup, but that’s okay, I’m perfectly content to drink it after dinner to continue the warming up process. 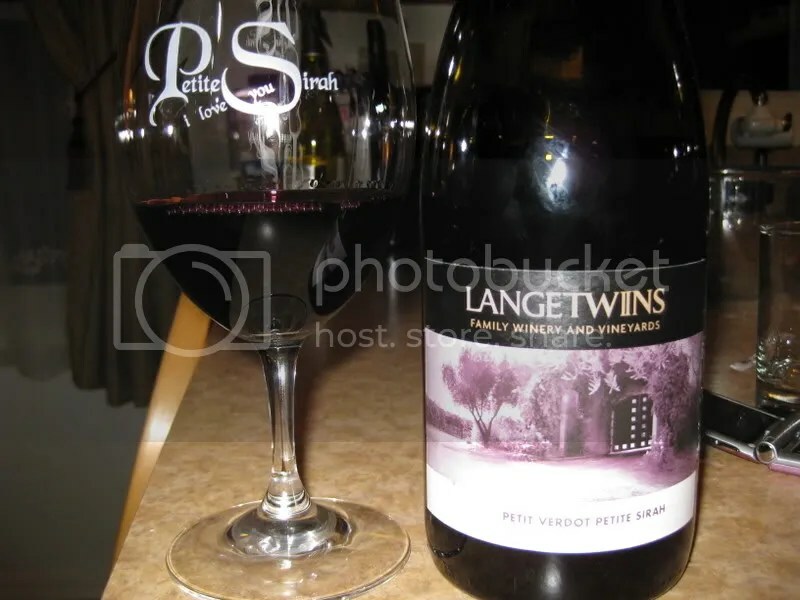 As I twittered away the other day, Lange Twins Winery sent me a message offering to send me a bottle of their brand new release: the 2007 Lange Twins Petit Verdot Petite Sirah. Being that those are two of my favorite reds grapes, blending them could only make an even more awesome wine, so I happily accepted. 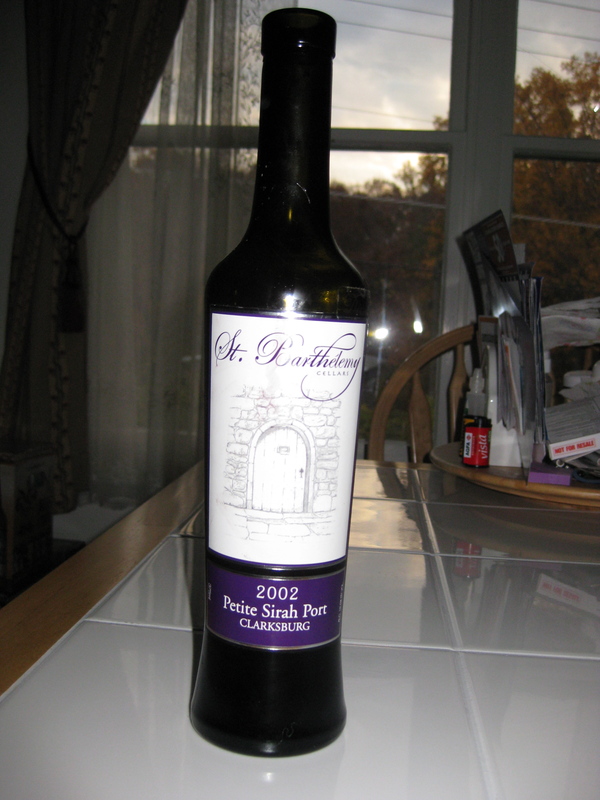 The 2007 PV/PS retails directly from the winery for $20, has a screw cap closure, and clocks in at 13.9% alcohol by volume. The wine is a blend of 66% Petit Verdot and 34% Petite Sirah. Serve in proper PSILY glasses. I first noted how incredibly dark the wine showed in my glass. No light got through this wine! On the nose I found blueberries, blueberry crumble, vanilla cream, black cherry, chocolate syrup, baking chocolate, raspberry, cracked black pepper, and a little eucalyptus. In the mouth, the fruit seemed tart and juicy. I got flavors of raspberry, tart black cherry, earth, anise, black plums, cranberry, espresso, and blueberries. The blueberries hid for a quite a while before they finally came out after a few hours in the glass. This wine is a baby. Especially with the giant tannic beast of Petite Sirah in it, it needs some time and/or vigorous decanting. You won’t be sorry though. After I let it sit out for a few hours, I got a treat in a $20 bottle of wine. A complex nose, great structure and acidity, and tannins to spare. Clean fruits, and interesting coffee and chocolate notes make this an incredible bargain at the price point. We all know how much I love Petite Sirah. So much so that last year I hosted a WBW dedicated entirely to the grape. I routinely buy every Petite Sirah a winery will pour me in their tasting room. (See my series a few weeks ago on all the PS and PS blends I bought while in Murphys!) Petite Sirah and Petite Sirah blends make up the second most represented type of wines in my basement (ignore my Cellartracker cellar, it’s not quite up to date). I wish that I could attend the Dark & Delicious event! This year it’s being held at the Rockwall Wine Company in Alameda, CA from 6-9pm on Friday, February 20. The cost is $50 in advance, $60 at the door (but really, it’s a popular event, you’ll probably want to buy your tickets early) and includes 3 hours of wine and food. The list of wineries pouring and vendors serving food keeps growing, just yesterday Stonehenge Winery joined the list alongwith Farm Fresh to You, an organic vegetable producer. I can personally vouch for the Petite Sirahs from many of the wineries pouring, including Concannon, Teldeschi, Foppiano, Huntington, Mounts Family Winery, Rosenblum Cellars, Trentadue Winery, and Twisted Oak. 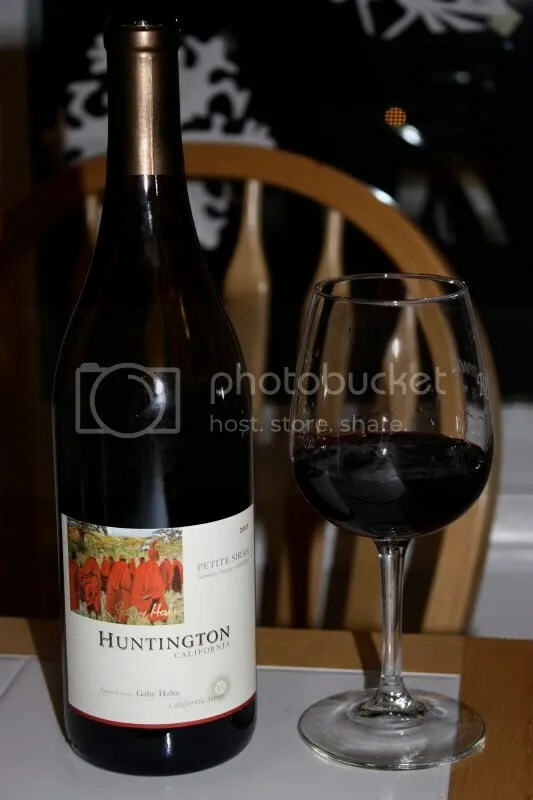 I’ve had other wines from several of the wineries as well, though not their PS. You can get all the details and purchase tickets here. I will be insanely jealous of all of you who can attend! P.S.- I am getting free tickets to the event, but I can’t use them, so that’s not the motivation for this post at all! I just think it’s a great event with an amazing line up of PS from at least 37 wineries and at $50 it’s a supreme bargain as far as wine tastings go. Bella has to be one of my favorite vineyards for big red wines. I regret the day I ever had to cut their club and am VERY happy to now be a member again. On the other hand, joining up again means that if I want another club I have to give up one that I already have. Ack! I still have massive numbers of tomatoes in my garden (seriously, I think I grew mutant tomato plants, we must have picked hundreds of tomatoes and are still picking them) so I whipped up some fresh sauce, tossed in a bunch of basil and parmasean cheese, cooked up some pasta and called it a meal. With the dinner, I picked a bottle of the 2005 Bella Hillside Cuvee to drink. We picked up 2 bottles of this on our latest trip to Bella and received a 3rd in a club shipment. The wine cost $28 minus a club discount, clocked in a 14.9% alcohol by volume, and had a real cork closure. The Hillside Cuvee is a blend of 54% Cabernet Sauvignon, 25% Zinfandel, 11% Petite Sirah, 10% Petite Verdot. On the nose of the wine I found espresso, dark cherries, blackberries, plum, chocolate, brown sugar, currants. The fruit struck me as big and dark, with lots of hints of other enticing aromas. In the mouth I got flavors of blackberry, plum, currants, boysenberry, blueberry, spice, and a bit of chocolate. The fruit came through as fresh and tart. Overall, the wine seemed a bit tannic, and it had a little bit of heat. I think this one needs some time, so I’ll hang onto my other two bottles and will report back over the next couple of years as we drink them. Not such a great match with my pasta dinner, but made for an excellent after dinner drink!